It was June 20, 1944 and 1st Lt. Leslie Nielsen was on his 28th combat mission over Nazi occupied Europe during World War II with only two more missions to fly. Their target: an oil refinery in Hamburg, Germany. 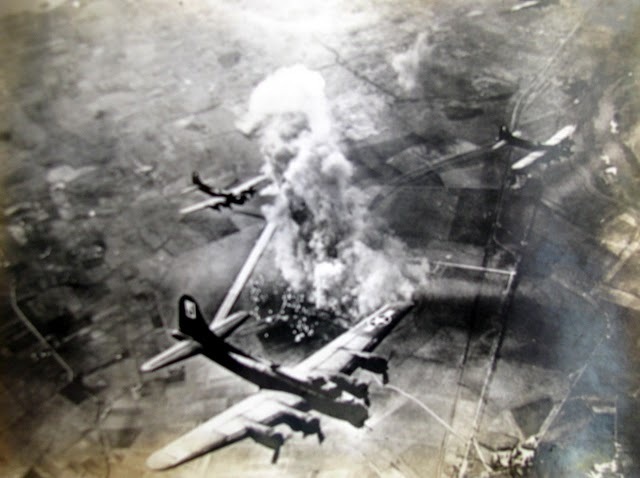 One of the four engines on the B-17 bomber he was co-piloting had burst into flames during their approach to the target. 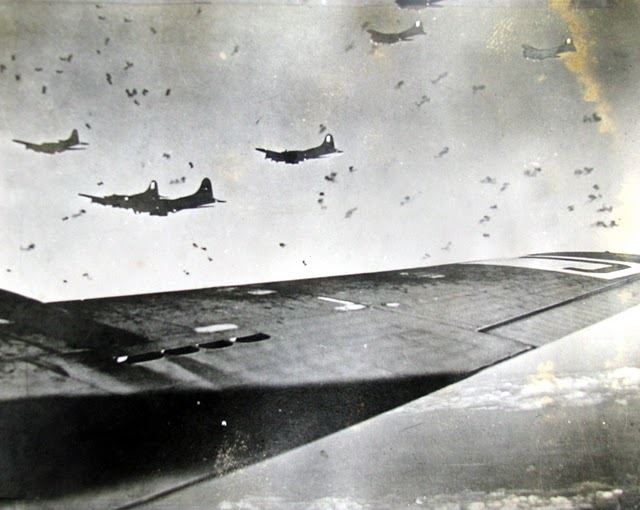 They dropped their bombs, managed to extinguish the fire and keep the “Flying Fortress” aloft until they could crash land in the choppy waters of the English Channel. 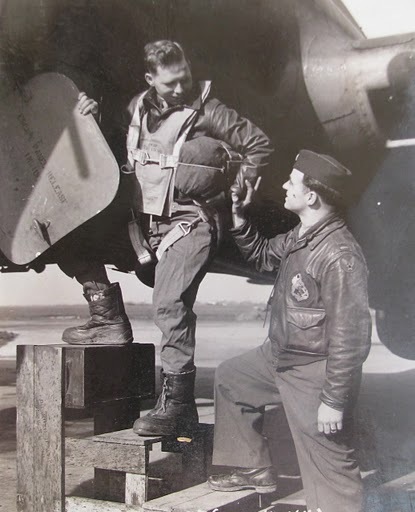 Leslie Nielsen is wished good luck by his high school friend Robert Long of Bloomfield, Conn. as he climbs into his B-17 at Kimbolton, England on his way to bomb the Third Reich. Photo provided. “Our squadron wasn’t suppose to fly this mission, but they needed one more squadron so we were assigned…. We didn’t like the idea because we knew it was going to be a rough mission,” he wrote more than 65 years ago. “Everything went smoothly until we got on the bomb run and things began to happen fast. A half minute before ‘Bombs Away,’ the number one engine started throwing oil that caused a push rod to destroy the engine, so I feathered the prop. About the same time, number three engine was hit by flak and lost oil pressure. I tried to feather that engine, too, but was unsuccessful. That caused a lot of drag on the plane. Number two engine also was hit by flak and caught fire. “Flak over the target was the most accurate and concentrated I have ever seen. Our target was a synthetic oil refinery. We got some very good hits on it. Flames and smoke could be seen 15,000 feet high. Reports indicate it was still burning two days later. 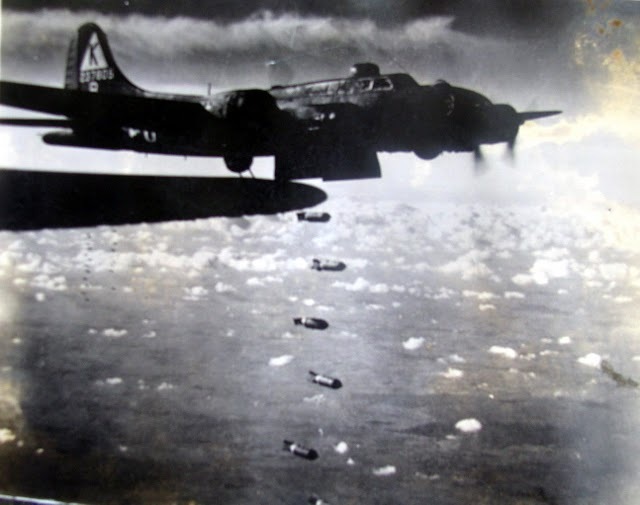 “We dropped our bombs and dropped back in the formation. We lost some altitude, but did get the fire put out. With number two and four engines pulling full power, and number three engine windmilling and creating drag, we managed to hold our altitude for nearly two hours. “During this time we contacted the base and got a fix. We also told them we expected to ditch in the English Channel. Fifty miles from England at 15,000 feet, we lost our number two engine and knew we would have to ditch. We also contacted Air-Sea Rescue and told them our situation so they kept a constant fix on us all the way down. “All but Jim (Wheat the pilot) and I went back to the radio room to clear out any loose equipment and take ditching stations. We made a good landing in the water only five miles from shore, but the sea was very rough and the ship broke up from the bomb bay back. Jim and I were the first ones out of the plane. “Staff Sgt. 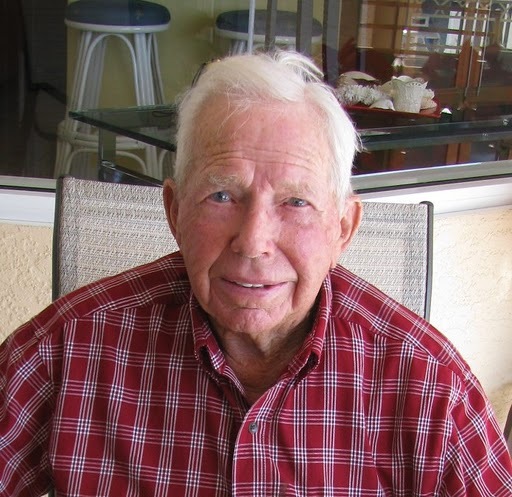 Alvin Carter, the tail gunner, got the life rafts out. We let one get away from us which didn’t help any. Jim got hold of a one-man dingy and got in it. I was first into the big raft and helped (2nd Lt. George) Berner, the bombardier, into the raft because he seemed dizzy and quiet helpless. “We got waist gunner (Staff Sgt. Robert) Mercado, (Tech-Sgt. George) Maisch, the radio operator, and Carter into the raft in that order. All the others stayed in the water hanging onto the raft as I started pumping more air into it and bailing water out. 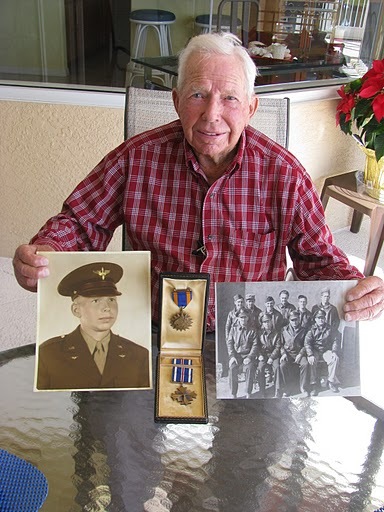 Remembering these experiences a lifetime ago while sitting around a table on the swimming pool patio of his son, David’s, South Gulf Cove home recently, the 94-year-old former B-17 co-pilot said he grew up on a family dairy farm outside Bloomfield, Conn.
On a return bomb run from Vienna, Austria during a later mission the squadron was trying to fly under a fog bank settling in along the Channel coast. “All of a sudden it cleared up and we could see the White Cliffs of Dover. They were up in front of us. As we cleared the cliffs we were almost out of gas. We spotted a fighter base and set down on the air strip. It was really scary,” he said. 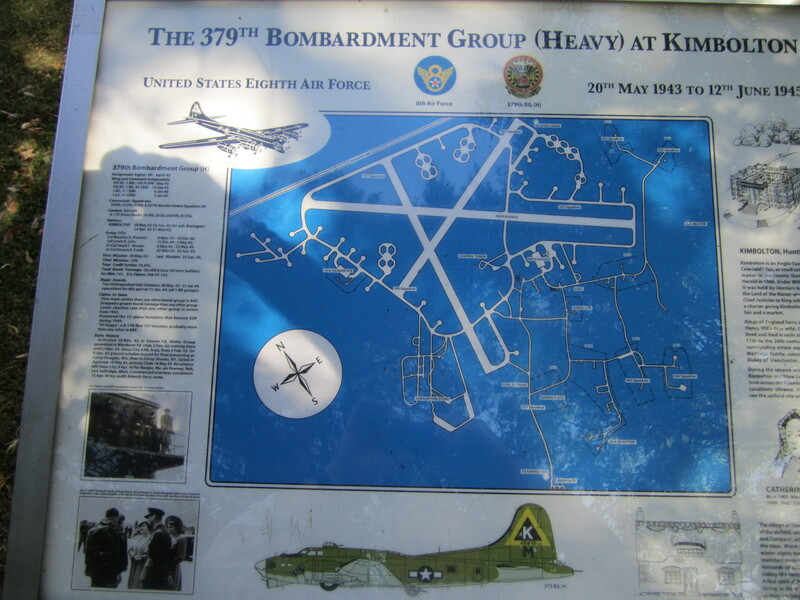 By the end of their 30 combat missions the 527th Squadron was flying out of a base near Toulouse, France. This allowed the squadron to reach further into Germany on their bombing runs. 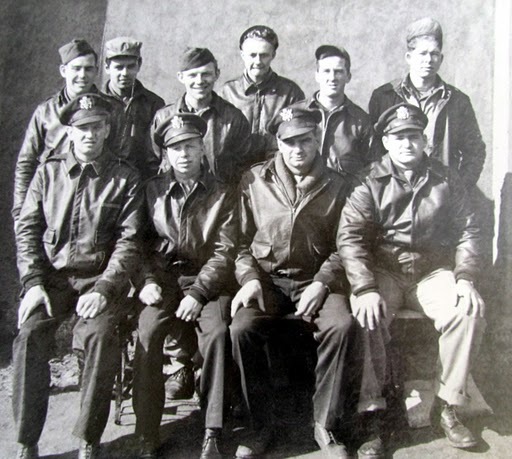 It was at this point Nielsen and his crew flew home from the war in Europe in their unnamed B-17. He spent the remainder of the Second World War flying submarine patrol along the East Coast of the US out of Langley Field, Va. When the war was over Nielsen returned to the farm. For almost 30 years he ran Chris Nielsen & Sons Dairy. The family had 120 head of Guernsey cattle that provided the milk. Current: South Gulf Cove, Fla.
Children: David of Port Charlotte, Fla., Janice Burk of Connecticut and Beverly Wallner of Arizona. This story was first published in the Charlotte Sun newspaper, Port Charlotte, Fla. on Monday, Jan. 17, 2011 and is republished with permission. It was a great article to read! Quite a coincidence – I’m from Portsmouth in England and am here in Englewood on Manasota Key for 10 days vacation. Actually, I’m using these days after a business meeting in Miami, to write a couple of scientific papers. Its so nice an quiet here! Lt Nielsen writes that he was stationed at Kimbolton. Well I went to school there from 1954 to 1963, before going to university in London. 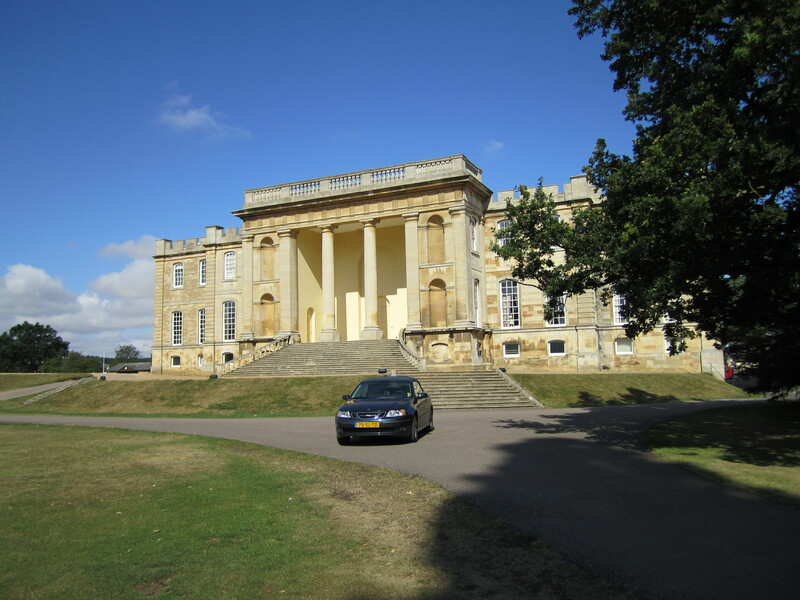 Kimbolton school is quite famous, it is housed in a real castle built in the year 1100 and later developed by the Duke of Manchester. It was the last home for Katherine of Aragon, wife of Henry VIII, before she was killed. Last November 2010, I re-visited the school, Kimbolton airfield, where Lt Nielsen was stationed and took a few photo which are still on my camera today. I thought I’d share them with you, maybe he would also like to see them! Thank you for your service to our country, Uncle Leslie! It is with much pride that I read this story. I was vaguely familiar with parts of it, but this is truly an inspiration. Great article. My father, Robert L. Deveny, was a bombardier on the Coral Princess at the same time and flew on 12 of the same missions as Leslie. I wonder if they knew each other? Thank you for your service. You are a hero in my eyes. Thank You for this article. Lt. George Berner was my Grandfather.